Sheila Shorr became frantic after her dog went missing. She spent the next few days searching for her beloved Australian Shepherd and was getting more worried with each passing day. About 60 hours later she finally located the pup. He was neck deep in thick mud, near a stream. A younger dog might have been able to make their way out. But not thirteen year old Pluto. The poor pooch spent, roughly 2 and half exhausting days holding his head up to keep from drowning. Willistown Township, Pennsylvania police were called and Sergeant Mike Martin and officer Mike Kushner arrived. 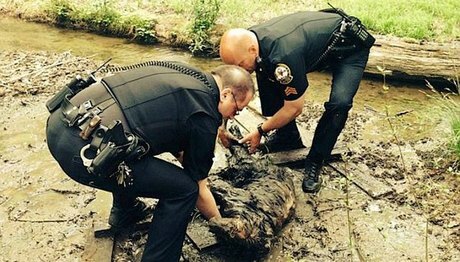 The officers used two planks of wood as a base so they could retrieve the dog. It took the strength of both men to gently pull out the fatigued dog. Pluto was so weakened and dehydrated from the ordeal that he could not even stand. He was immediately taken to Willistown veterinary hospital. After a few days he was healthy enough to return home, but not without a few battle wounds from the incident. He had matted fur, a few sores and a slight limp. Sheila Shorr is grateful to the hero officers that saved the day and a precious member of her family. The mudd was most likely caused by rainfalls in Pennsylvania prior to Plut’s disappearance.